This is the first Tomb Raider game I’ve played since the very first one way back when. The consensus from a few internet reviews that I read is that I haven’t missed much. Legend is the first Tomb Raider game produced by Crystal Dynamics, who were given the franchise to resurrect after the supposedly abysmal Tomb Raider: Angel of Darkness. They took the pre-existing Lara Croft, with her aristocracy and disinterest in anything other than archaeology, and added a new back-story, which is fed to the player a piece at a time by the game’s narrative structure. As one who appreciates game stories as much as the regular variety, I liked the extra depth that this brought to both the character and the game. The quality of the game is also apparent in the way that I’m choosing to suffer intense nausea just to play it. One of the problems with Tomb Raider: Legend is that the camera often swings around wildly and uncontrollably, making my eyes and inner ear have arguments in my brain about the gymnastics that are(n’t) supposedly happening. On a side note, the Wikipedia article on motion sickness mentions that drinking soft drink helps. Maybe that’s why the stereotype of gaming geeks usually involves a bottle of fizzy somewhere, because apparently, motion sickness is quite common. Now I just have to try and get through the rest of the game without throwing up. Pace myself, that’s all I have to do. It’s supposed to be a pretty short game anyway. I’ll do a follow-up post if there’s anything worth writing about that I haven’t mentioned already, but I think I’ve already gushed enough! 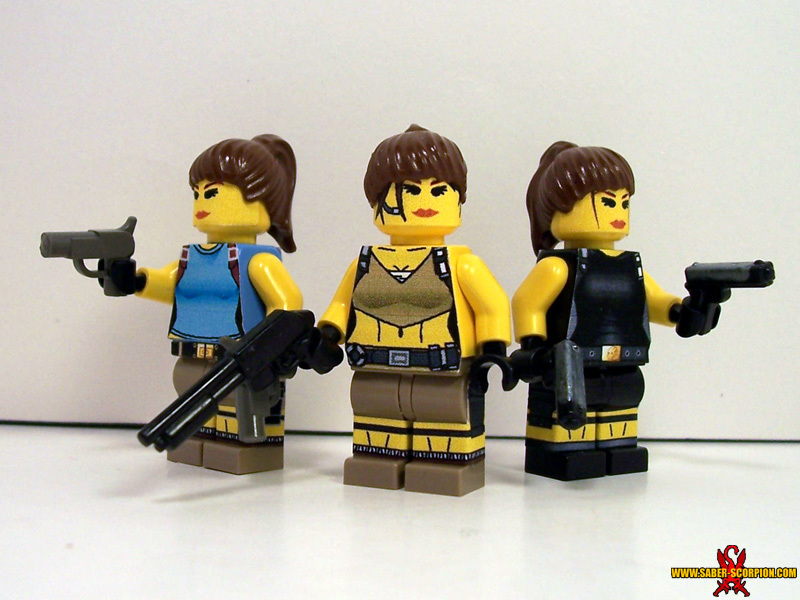 The lego figurines (or “minifigs” in the vernacular) are the creations of Justin R. Stebbins. You can find more pictures at his Website, Saber-Scorpion’s Lair.